The incidence of recurrent wheeze in young children is a common and growing problem in the UK. Rational management is highly dependent on sound identiﬁcation of causes and proper diagnosis, both of which represent signiﬁcant challenges for GPs. Child respiratory specialist Jayesh Bhatt explores the issues and the evidence base. Leyla, a 15 month old girl, has a history of frequent wheezy episodes from nine months of age. Following the ﬁrst episode in October, she was admitted for two days and was treated with prednisolone and inhaled salbutamol. She had rhinovirus on her respiratory secretions. Subsequently, she had wheezy episodes almost every month; the most recent hospital admission was for 10 days and included paediatric intensive care. On all these occasions Leyla was given treatment with prednisolone, oxygen and nebulised bronchodilators. She remained symptom free in between episodes, but whenever she had a cold she seemed to get very severe wheezing illness. Leyla’s parents are non-smokers but have a wood-burning stove in the house. Her mother suffers from asthma, but there is no other signiﬁcant past medical history. Leyla was born at full term with no neonatal respiratory or bowel problems. On previous examination her weight and height were tracking the 50th and 25th centiles respectively. There was no chest deformity; the chest was completely clear and no warning features were found on systemic examination. At a subsequent consultation, more recently without colds, she is reported to become easily short of breath and to have a wheeze when crawling. You are able to conﬁrm this in the clinic. There is also an associated dry cough, more noticeable at night time. She has frequent sneezing but no runny nose without colds and has moderate eczema. There is no food allergy and no history of discharging ear infections. Children with episodic (viral) wheeze are well between episodes. The most common viral triggers include rhinovirus, respiratory syncytial virus (RSV), coronavirus, human metapneumovirus, parainfluenza virus and adenovirus 5 – although in routine clinical practice microbiological diagnostic studies are rarely performed. In young infants, episodic (viral) wheeze may be difficult to distinguish from acute bronchiolitis – not least because the definition used for this clinical syndrome varies in different parts of the world. In the UK, Australia and parts of Europe, bronchiolitis is defined as the presence of upper respiratory tract symptoms with coryza and cough preceding the abrupt onset of lower respiratory symptoms, with a variable degree of respiratory distress, feeding difficulties and hypoxia. On auscultation there are widespread crepitations. Wheeze may or may not be present. When is a wheeze not a wheeze? 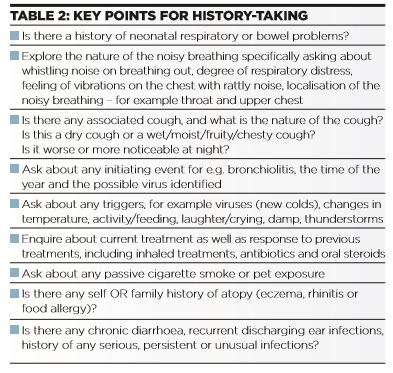 Diagnosis of wheeze may be complicated by the presence of other conditions that give rise to noisy breathing and which could be misidentified as wheeze, as well as the wide differential diagnosis of wheeze in young children (Table 1). Rational management is focused on exploring the true nature of noisy breathing, as summarised in Table 2. Even among health professionals there are inter- observer variations in assessing wheeze using a stethoscope. 18 Furthermore, in pre-school children, lung function 19 and bronchoscopic findings 20 are different in those with parent-reported wheeze, as compared to doctor-confirmed wheeze. Longitudinal studies suggests that approximately 50% of wheezing children outgrow their symptoms. This is largely accounted for by transient early wheeze, which probably has no association with asthma. MTW, in contrast, is more likely to represent asthma. A recent review 24 summarises various predictive indices of subsequent asthma risk to help the clinician identify those children who will continue wheezing into older childhood. These indices appear to have high negative predictive values and can thus help identify the children who are at low risk of later asthma and those in whom prolonged therapy might not be useful. However, these indices remain imperfect at identifying children at risk of asthma. There is as yet no definitive biomarker to identify children with high-risk phenotypes who will go on to have persistent asthma. Documenting a normal chest x-ray. 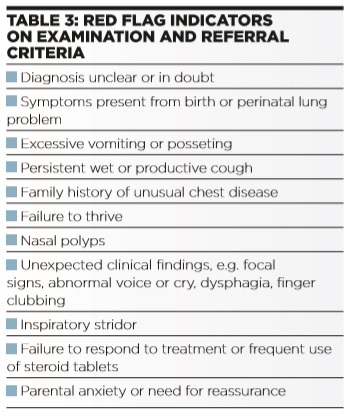 Chest x-ray should be requested if there is very severe wheezing, focal or assymetrical chest signs, associated prolonged (longer than 4 weeks) wet cough, or if any other red flag indicators (Table 3) are present. 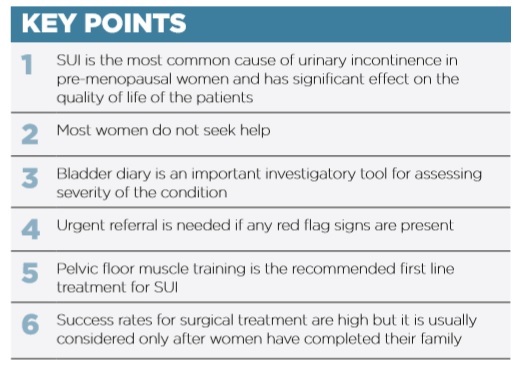 Children should always be referred for further investigations if there are red flag features (Table 3) in the history, if examination is suggestive of other pathology, or if the diagnosis is unclear or in doubt. Primary prevention is not possible, but avoidance of environmental tobacco smoke exposure should be strongly encouraged. Oral corticosteroids: The practice of giving parents a supply of oral prednisolone to administer to their children at the first sign of a wheezing episode cannot be justified as there is no benefit in terms of symptom scores, number of outpatient visits, number of attacks or hospitalisations.34,35 For children presenting to the emergency department, the evidence for using oral steroids is conflicting36,37 and remains in equipoise. Pragmatically, oral steroids should be reserved for a child with an atopic background and frequent and severe wheezing requiring oxygen on admission. For these children, it would be reasonable to give a short course of oral prednisolone as one would for an older child with asthma. Leyla is seen in the respiratory clinic, a careful history is obtained and base line investigations performed. Treatment is sequentially commenced with inhaled ﬂuticasone via spacer and then montelukast – with good response. Her symptoms improve and there is a dramatic decline in the need for attendance at the emergency department and subsequent hospital admissions. She is given a break from treatment over the summer and is actually able to stay off inhaled ﬂuticasone for the entire summer period. Currently she remains only on oral montelukast and has not had any admissions for nine months. 1 Martinez FD, Wright AL, Taussig LM, N Engl J Med 1995;332:133-8. 2 Kuehni CE, Davis A, Brooke AM, et al . Lancet 2001;357:1821-5. 3 Stevens CA, Turner D, Kuehni CE, et al . Eur Respir J 2003;21:1000-6. 4 Brand PLP, Baraldi E, Bisgaard H, et al . Eur Respir J 2008;32:1096-110. 5 Papadopoulos NG,.Kalobatsou A. Curr Opin Allergy Clin Immunol 2007;7:91-5. 6 Everard ML. In Taussig LM, Landau LI, eds. 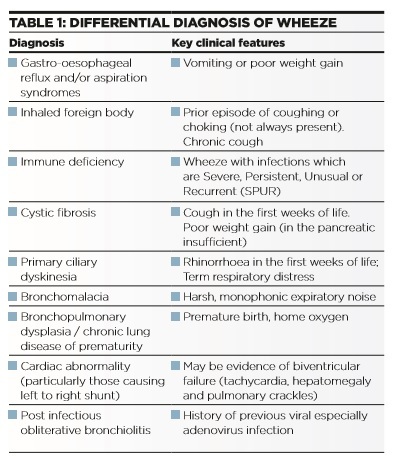 Pediatric Respiratory Medicine, Mosby, 2008. 7 Bont L, Aalderen WM, Kimpen JL. Paediatr Respir Rev 2000;1:221-7. 8 Lemanske RF, Jr., Jackson DJ, Gangnon RE, et al . J Allergy Clin Immunol 2005;116:571-7. 9 Boehmer AL. Paediatr Respir Rev. 2010 ;11(3):185-90. 10 Jackson DJ. Curr Opin Allergy Clin Immunol . 2010 ;10(2):133-8. 11 Jackson DJ, Evans MD, Gangnon RE, et al . Am J Respir Crit Care Med . 2012 ;185(3):281-5. 12 Schultz A, Devadason SG, Savenije OE, et al . Acta Paediatr 2010;99:56-60. 13 Cane RS, Ranganathan SC, McKenzie SA. Arch Dis Child 2000;82:327-32. 14 Cane RS,.McKenzie SA. Arch Dis Child 2001;84:31-4. 15 Elphick HE, Sherlock P, Foxall G, et al . Arch Dis Child 2001;84:35-9. 16 Elphick HE, Ritson S, Rodgers H, et al . Eur Respir J 2000;16:593-7. 18 Elphick HE, Lancaster GA, Solis A, et al . Arch Dis Child 2004;89:1059-63. 19 Lowe L, Murray CS, Martin L, et al . Arch Dis Child 2004;89:540-3. 20 Saglani S, McKenzie SA, Bush A. Arch Dis Child 2005;90:961-4. 21 Turner SW, Craig LC, Harbour PJ, et al . Arch Dis Child 2008;93:701-4. 22 Mellis C. Pediatr Clinic North Am 2009;56:1-17. 23 Mohangoo AD, de Koning HJ, Hafkamp-de Groen E, et al . Pediatr Pulmonol. 2010;45(5):500-7. 25 Saglani S, Nicholson AG, Scallan M, et al . Eur Respir J 2006;27:29-35. 26 Mass T, Kaper J, Sheikh A, et al. Cochrane Database Syst Rev 2009;Issue 3. Art. No. : CD006480. 28 Conner WT, Dolovich MB, Frame RA, Pediatr Pulmonol 1989;6:263-7. 29 Kraemer R, Frey U, Sommer CW, Russi E. Am Rev Respir Dis 1991;144:347-51. 30 Carroll WD, Srinivas J. Arch Dis Child Educ Pract Ed. 2013 ;98(3):113-8. 31 Cates CJ, Crilly JA, Rowe BH. Cochrane Database Syst Rev 2006;Issue 2. Art. No. : CD000052. DOI:10.1002/14651858. CD000052.pub2. 32 Everard M, Bara A, Kurian M, et al. Cochrane Database Syst Rev 2005;Issue 3. Art. No. : CD001279. DOI:10.1002/14651858.CD001279.pub2. 33 Plotnick L,.Ducharme F. Cochrane Database Syst Rev 2000;Issue 3. Art. No. : CD000060. DOI: 10.1002/14651858. CD000060. 34 Grant CC, Duggan AK, DeAngelis C. J Pediatr 1995;96:224-9. 35 Oommen A, Lambert PC, Grigg J. Lancet 2003;362:1433-8. 36 Csonka P, Kaila M, Laippala P, et al . J Pediatr 2003;143:725-30. 37 Panickar J, Lakhanpaul M, Lambert PC, et al . N Engl J Med 2009;360:329-38. 38 Ducharme FM, Lemire C, Noya FJ, et al . N Engl J Med 2009;360:339-53. 39 Bhatt JM, Smyth AR. Paediatr Respir Rev. 2011;12(1):70-7. 40 Bisgaard H, Zielen S, Garcia-Garcia ML, et al Am J Respir Crit Care Med 2005;171:315-22. 41 Knorr B, Franchi LM, Bisgaard H, et al . Pediatr 2001;108:E48. 42 Robertson CF, Price D, Henry R, Mellis C, et al. Am J Respir Crit Care Med 2007;175:323-9. 43 Bacharier LB, Phillips BR, Zeiger RS, et al . J Allergy Clin Immunol 2008;122:1127-35. 44 Ater D, Shai H, Bar BE, et al . Pediatrics. 2012;129(6):e1397- 403.